THE Conservatives got off to a flying start with a clean sweep in the Horsell ward. Beryl Hunwicks, Colin Kemp and Anne Murray clinched, four, three and two-year terms respectively as residents emphatically voted in a block of blue. Councillor Kemp, who was straight on the phone to celebrate with his partner, hailed the teamwork on show in the landslide result. He told the News & Mail: “People may think that this is a result of six weeks’ campaigning, but this win has been two, three, four years in the making because myself, Anne and Beryl all work as a team. 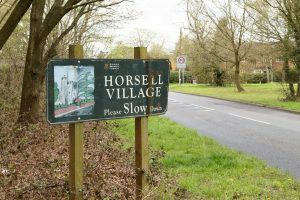 “It’s great that Horsell is now back together (previously Horsell West and Horsell East), and the turnout (the highest in the election) shows that it is a ward that cares. His views on camaraderie were echoed by Cllr Hunwicks, who added: “Residents of Horsell are very mindful of what their councillors are putting in, and it is well known in the ward that Colin, Anne and myself always respond to a query within 24 hours. “Another strength of our team is that we never assume anything. “When it was announced that the Horsell West and Horsell East wards were due to merge, I spent a great deal of time visiting 99% of the properties in the new boundaries to introduce myself. Cllr Murray, who has sat in the chambers for 13 years, was also left celebrating ahead of her mayor-making later this month. She said: “This result is the icing on the cake with my mayor making coming up. I’ve been a councillor for 13 years now and I’m very much looking forward to representing a bigger area after the boundary changes.